The common greenshank (Tringa nebularia) belongs to the family of sandpipers and greenshanks, the Scolopacidae. 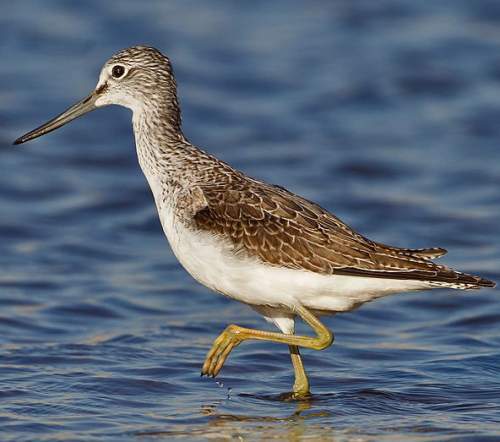 The common greenshank species is distributed in central and northern Eurasia, southwest Europe, Africa, Indian subcontinent, southeast Asia, China and Australia. These greenshank species have greenish legs. These greenshanks are monotypic species. The common greenshank (Tringa nebularia) is a medium sized greenshank, measuring 30 to 35 cm in length and weighing 120 to 300 grams. The wingspan is 65 to 70 cm. The breeding common greenshank has white head and neck with heavy dark brown streaking. There is a faint brown lore. The wings and back have brown patterns. The throat and the sides of the breast have fine streaking. The rump is white. The uppertail has fine bars. The underparts are white. In flight, the tips of the toes slightly project beyond the tip of the tail. In wintering birds, the plumage is grayish brown. The bill is long, robust and slightly upturned. The irises are dark brown. The legs are long and yellowish green. The call of these common greenshank species is a ringing whistling "too-hoo-too-hoo" or "kiwe..kiwe..kiwee" sound. The breeding populations of the common greenshank species are distributed in central and northern Europe and central and northern Asia. The wintering populations of these common greenshanks are distributed in southwest Europe, Africa, Indian subcontinent, southeast Asia, southeast China and Australia. In India, the wintering common greenshank species are distributed in most of the states except for the arid regions of Rajasthan. They are also distributed in Andaman and Nicobar Islands as well as Lakshadweep Islands. 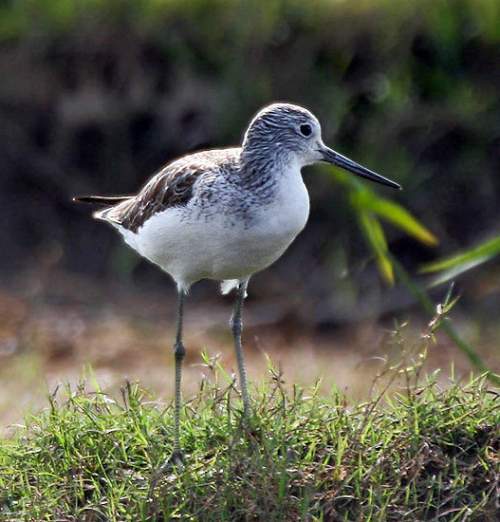 The Important Bird and Biodiversity Areas (IBA) of these common greenshank species in China are, Yueqing Wan, Yalu Jiang Estuary, Wenzhou Wan and Chongming Dongtan Nature Reserve. The IBA of these common greenshank species in South Korea are Tidal flat area of southern Ganghwa-do island, Sihwa-ho lake, Dongjin estuary, Daebu-do island, Cheonsu Bay, Baeksu tidal flat, Yawri Bay and Asan Bay. Some of the IBA of these species in Russia are, Forty islands, Nevskoye Lake, Bystroistokskaya, Dvuob'ye, Kondinskiye lakes, Russkoye lake, Ust'-Ozerninskiye bogs, Vizhay river, Zaikovo forest, Adovo-Chugrumski wetland and Kivach Nature Reserve. These common greenshank species have low forest dependence. They normally occur in altitudes from 0 to 1200 meters. The artificial ecosystems and habitats of these species include aquatic excavations, aquaculture ponds, salt works and reservoirs. 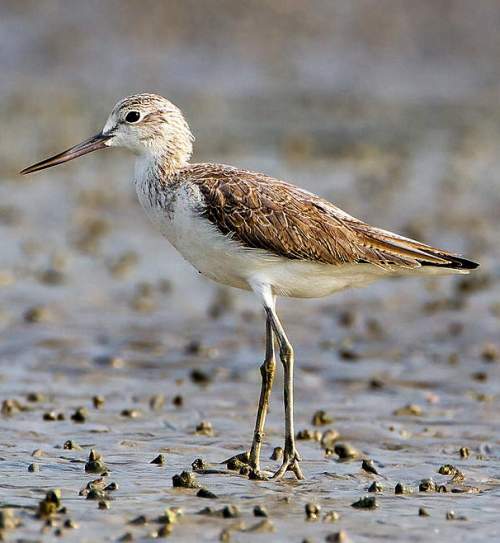 The natural ecosystems and habitats of these greenshank species include mangrove forests, tropical and subtropical flooded grasslands, freshwater lakes, intertidal mudflats, shorelines, tidepools, lagoons, coral reefs, estuaries, marshes and inland wetlands. The diet of these common greenshank species consists mainly of insects. Insects, worms, beetles, flies, termites, ants, spiders, crustaceans, molluscs, amphibians and small fish are their primary food. They catch insects on dry grounds as well as probe soft mud. The breeding season of these common greenshank species is April to June in most of their breeding range. These species are mostly monogamous and territorial. In some cases, polygamous behavior has been observed. The nesting sites are located in boreal forest zone at zero to 1,200 meter levels (Johnsgard 1981, Snow and Perrins 1998). They also nest near marshes, forest clearings and woody moorland. The nest of the common greenshank is usually a shallow scrape on the open ground placed near rocks, dead wood or trees. It is lined with plant material (Snow & Perrins 1998). The common greenshank clutch contains four oval buff colored eggs with dark brown spots. Both the parents incubate the eggs for 22–25 days (del Hoyo et al. 1996). The chicks fledge 25-30 days after hatching. These common greenshank species are fully migratory. The breeding populations in central and northern Europe and central and northern Asia migrate southwards from early July (del Hoyo et al. 1996, Snow and Perrins 1998). The return migration of the common greenshank occurs during March. Some non-breeding greenshanks may remain back in their wintering range during summer. The global population size of the common greenshank (Tringa nebularia) is estimated to be about 440,000 to 1,500,000 individual birds. The overall population trend of the species is considered to be stable. In most of its range, this species is reported to be rare to uncommon. The generation length is 6.3 years. Its distribution size is about 18,700,000 sq.km. Habitat alteration and destruction, draining and loss of wetlands, climate change, pollution and human intrusions and disturbance are the main threats that are endangering the survival of these species. The common greenshank (Tringa nebularia) does not approach the thresholds for being Vulnerable, either under the range size criterion, or under the population trend criterion or under the population size criterion. The IUCN (International Union for Conservation of Nature) has categorized and evaluated the species and has listed it as of "Least Concern". The CITES (Convention on International Trade in Endangered Species of Wild Fauna and Flora) status is ‘Not Evaluated’ for the common greenshank (Tringa nebularia). The common greenshank (Tringa nebularia) is closely related to Nordmann's greenshank or spotted greenshank (Tringa guttifer). Current topic in Birds of India: Common greenshank - Tringa nebularia.